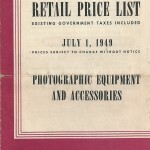 This is an 8.5″ x 4″ fold out Keystone 1949 retail price list. The list is for photographic equipment. I have a Moviegraph Projector Model No. D-752 16mm made by Keystone Manufacturing Company of Boston Mass. I need a replacement bulb. Any idea where I can locate a new bulb? I don’t know much about the film equipment that Keystone produced. My concentration is on their wooden toys. If you google Keystone cameras or projectors several websites will come up that may be able to help.